Review posted July 18, 2015. Moonbot Books, Atheneum Books for Young Readers (Simon & Schuster), New York, 2015. 54 pages. In this book, William Joyce explains for kids how he got his start writing picture books. He was in fourth grade, and he wrote a book for a school contest. He worked hard on it. He exercised his imagination. The book he wrote and drew the pictures for is included in the center of this book. What I love about it is that it reminds me of the stories my sons wrote when they were in about fourth grade. The smaller book is called Billy's Booger and explains how Billy and his booger got bonked by a meteorite and gained super powers. The booger became a mathematical genius, and Billy could call on it at all times. The President of the United States asked advice from Billy and his Super-Booger! Billy is tremendously disappointed when he doesn't win any prize at all, not even honorable mention. 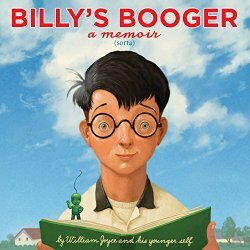 But the librarian puts all the kids' books in the library -- and Billy's Booger gets checked out more than any other book. And so began the adventures of a picture book author.